We are starting a new feature on our blog! Every Saturday, we will be sharing a Weekly Meal Plan. We will share dinner ideas for every day of the week, Monday-Sunday! We will also throw in a few breakfast, snack, and dessert ideas! We hope these posts make it easier for you to get dinner on the table! And don’t feel like you have to make every single recipe…or on the exact day. For example, if you want to make Monday’s recipe on Thursday, go for it! 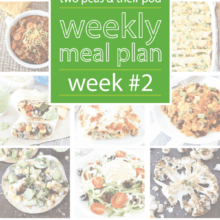 Or if you want to only make two of the recipes during the week, perfect! These meal plans are meant to be a guide! Feel free to change the plans up to meet your needs! If you make one of our recipes, take a picture and share on Instagram! Use the hashtag #twopeasandtheirpod! We want to see what you are making in your kitchen! And don’t forget to follow us on Instagram! Monday: Creamy Tomato Orzo Soup-this soup is made creamy with Greek yogurt, instead of heavy cream, so it’s delicious and healthy. Pick up a loaf of crusty bread to dunk in your soup! Tuesday: Goat Cheese Lemon Pasta with Kale-this pasta dish takes less that 30 minutes to make, so it’s perfect for a busy weeknight dinner. Wednesday: Black Bean and Quinoa Enchilada Bake -one of our favorite meals and one of the most popular recipes on our site! If you have leftovers, reheat the next day for lunch! Thursday: Roasted Broccoli Grilled Cheese-a quick and easy meal…and a great way to get your veggies too! Friday: Spinach Artichoke Pesto Pizza-perfect for Friday pizza night! Oh, and it’s Friday so you deserve some cookies! Make a batch of Butterscotch, Toffee, Chocolate Chip Cookies! TGIF! Saturday: Whole Wheat Granola Blueberry Pancakes-we love making a big breakfast on Saturday mornings! Make pancakes in the morning and get takeout for dinner! Sunday: Spinach Artichoke Lasagna Roll Ups-fun to make and fun to eat! Serve our Apple, Grape, and Candied Pecan Salad with Maple Mustard Dressing on the side and Brown Butter Pear Crisp for dessert! All these recipes are vegetarian! I don’t think I realized your family didn’t eat meat. Or maybe it’s coincidence? They all sound yummy. I’ll definitely be making a couple of them. Great new feature! I’ve been a longtime follower of your wonderful blog and I love it. My favourite posts are His & Hers, although I’ve always wondered why his comes before hers because alphabetically hers should go first! Haha. Well Please keep up the great work. What a great post – I love the sound of the pesto pizza! 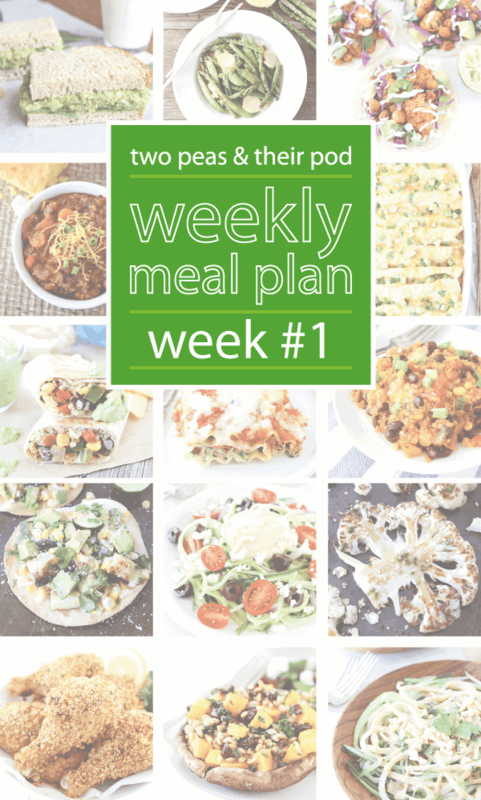 I am a vegetarian and WOW!–could you have made my meal planning any easier? I don’t think so! Love this new feature. Thank you! Love this!!! I’ve tried so many of your recipes (the eggnog white chocolate cake was delicious and made the house smell heavenly!). You make a plant based diet easy and delicious! Thank you! I’m a vegetarian too, but the kids and hubby enjoy meat occasionally. This will be a great place to start with our own dinner plan for the week. Wow! Fabulous list. I’ve just made my shopping list for the week after showing my boys all the pictures and they both nodded and said they’d try them all. Love that the recipes are vegetarian. Just an FYI that the grape, apple and pecan salad link isn’t working. I fixed the link! All the links should be working now! Thanks for letting me know! What a great idea, I often find myself cooking the same things over and over again, with your fabulous plan, we’ll eat more vegetarian, and I get to stop struggling with ” what shall we have for dinner? I menu plan every Saturday morning and your new feature is perfect! Thank you. Your blog is always one of my first stops when meal planning. Our family is also half meat eaters, half vegetarian and our youngest was recently diagnosed with Celiac’s. Keeps meal plans interesting! Thanks for always visiting our blog! I hope these meal plans are helpful! Never before have I been so inspired by someone else’s meal plan! Thank you so much for sharing. I love your use of whole foods and I’m really looking forward to next week’s plan! Yay! I am so glad you like the meal plan! What a terrific idea. Makes life much easier when you have a plan for evening meals. Your lemony pasta sounds fantastic! Love this new feature! Thank you. I will look forward to Saturdays. Are the meal plans you’re posting about the things you’re having for dinner during the week, or just suggested menus for everyone? They are suggested menus for everyone, but we plan on using them too! We will be making the recipes! TY TY for posting a weekly meal list!! I have a hard time trying to decide what to make that is both delicious and healthy. I have made your quinoa and black bean bake before and it is divine! I’m so glad that I have found this site. I, too!… Am inspired by this meal plan. I’m especially excited that I noticed its vegetarian! I eat meat but I’ve been looking for a change and I may have found it. Thank you! THANK YOU!! We’re trying to be more proactive about meal planning in 2015, and we already have several favorites from your blog. Trying to keep it fresh and find recipes without meat isn’t always easy. We know how much time it can take to plan ahead, so thanks so much for sharing your effort to make our week a little easier! Love, love, love the new feature! Meal planning can be super challenging — this is going to be tremendously helpful for so many people. Thanks for sharing! I always have a better week when the meals are planned out and everything is ready for dinner. This is a great new feature. I love your blog and your recipes. This is a great idea. Is there a shopping list for the recipes involved in the weekly meal plan? If not, that would be a great addition. love the meal plan! 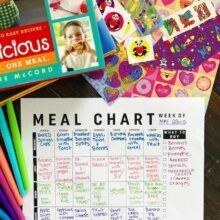 As a new mom of a 7 week old, Meal planning has been tough! Thank you so much! Meal planning is one of my least favorite chores of the weekend! It’s not my situation now, BUT in the past just coming up with some new recipes for that age old question What to have for dinner? for example was a real bugaboo. This roster would take the angst out and help plan a comprehensive grocery list. This is great! And, I’m vegetarian, but my husband and little guy are not. Although the little guy tends to eat more vegetarian than he thinks. So, I’d love some advice, at our last check up for him (he’s 5) the doc said he’s a touch low on iron. He loves broccoli and we eat spinach and lentils regularly. Any tips/tricks you have for ensuring iron? And , thank you! love your blog and recipes! I love your recipes! Any chance of being supported by Pepperplate? I store everything in there and it’s so helpful with meal planning and grocery lists! I am so excited about your meal plans!! Yeah! Keep them coming! Would this work for me? I’m a teen in eating disorder recovery. Any advice or words? I have so many questions but I’m sorry for bothering y’all. But this website seems like a good start!? I stumbled across your web site and I must say, I love it. The meal plans are wonderful and the recipes are great. We don’t eat meat so there are many recipes we are going to try. Thank you! This is my first visit to your blog and I’m in love with it! And of course, my mother will definitely love it too. Being a vegetarian she always loves to cook food putting more emphasis on veggies. I am not the biggest fan of leftovers. I dread thinking about what I want for the week and shopping. I have one question…Do you have a shopping list for this meal plan? It would be a great help to me. Thanks!!! These meals sound so good! I’m going to have to give a few of these a try!